Anticipating the announcement of the site for the proposed Commonwealth nuclear waste facility in the Northern Territory later this month, theweathergroup_U invite you to a special documentary screening at Cockatoo Island. "Nowhere here in the middle." Produced and Directed by Tara Jones. and told you it's perfectly safe.. 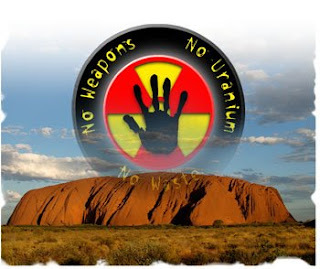 The proposed radioactive waste dump is an integral component of the federal government's plan to expand Australia's Nuclear Industry. An inspiring story of indigenous insight and resistance, 'Nowhere here in the Middle' travels to the Northern Territory to meet the people who live at the proposed sites, shedding light on the dark implications of the government's plans. What the government calls "the middle of nowhere", these people call home. Great work guys !! Will blog you later.